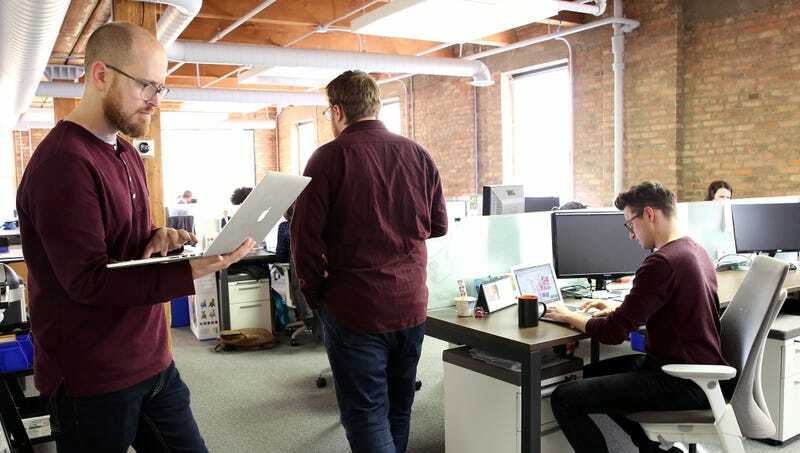 CAMBRIDGE, MA—Saying the likelihood of such a phenomenon occurring was near impossible, leading probability researchers told reporters Wednesday that they were confounded by reports that three coworkers at a Nashville-area office were wearing the same shirt color on the same day. “The entire statistics community is absolutely reeling—the unthinkable has apparently happened,” said MIT’s Dan Felder, noting that no theories or formulas currently exist that could explain the fact that three coworkers at software development company QData arrived at work wearing shirts the exact same shade of maroon. “We at least have models for something like two people coming to work wearing the same shoes or both getting a haircut the day before, but this is the equivalent of lightning striking in the same place hundreds of times in a row. We’re going to have to go back to the drawing board on probability analysis entirely.” At press time, desperate researchers had reached out to the coworkers directly in the hopes of learning that what had occurred was nothing but a coordinated stunt.